This Christmas story involves a friend who recently became part of our circle, although through one of life’s coincidences had very briefly crossed paths with Pat exactly 40 years ago. On Christmas Day 1968, Pat (then in his early 20s) and his dear cousin Baba Dolan (in her mid-80s) were sitting on the wide, colonial-style veranda of Baba’s mountain-side home high above Honolulu in Hawaii. As usual, she was telling stories while knitting, her dog at her feet and rocking on her rocking chair. She loved to reminisce about the old days. It was at the end of the nineteenth century when her mother came to Hawaii on a clipper ship from San Francisco. The voyage took 69 days. Of these 39 were becalmed within sight of the smoking volcano of the Big Island. There’s quite a story of Baba, her family, the horse cavalry, and the final days of the Hawaiian monarchy. Baba’s mother was one of the last governesses of Princess Kalulani, the last princess of Hawaii. So many stories... but these are for another time. December 1968 was a historic month. On Christmas Eve, Apollo 8 reached the moon and started a series of orbits. Pat point out to Baba how remarkable it was that during her lifetime she had experienced the end of the golden days of sail, the first flights made by the Wright brothers, and now the excitement of three men who were actually circling the moon. The space age had arrived. At no other time in history had people lived to bridge such technological leaps. All the papers carried the news that should the mission be successful, which certainly was a question, the space capsule would land in the Pacific upon return to Earth. The astronauts would be picked up and flown to Hickam Air Force Base on O’ahu. Formerly Hickam Field was the parade grounds for the American Horse Calvary, of which Baba’s father had been a member. Pat and Baba along with half of the population of Honolulu shared the same thought — why not go out to Hickam and cheer the astronauts. In those days security was a non issue. Pat and Baba simply parked their car at the edge of the base and walked through a gap in the fence (just a four-foot-high chain-link somewhat in disrepair) onto the runway along with everyone else. The plane which ferried the astronauts from the air-craft carrier that met their floating spacecraft, landed and the red carpet was rolled out. Bill Anders, Frank Borman, and Jim Lovell walked out, waving and talking to everyone. Baba and Pat called “hello” and “welcome home” to the astronauts. Pat photographed the occasion. We have that photo yet today. Nearly four decades passed and Rosemarie started corresponding with Bill Anders. Rosemarie is an officer of The Explorers Club and in this capacity she invited Bill and his wife to join the annual Salt Spring Symposium that she and Pat host for club. The Anders did attend. Both gave stellar presentations and have become good friends. 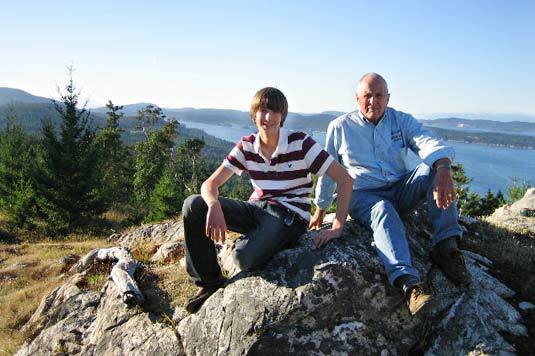 From that September gathering, here’s a photo of our son Glen with Bill. 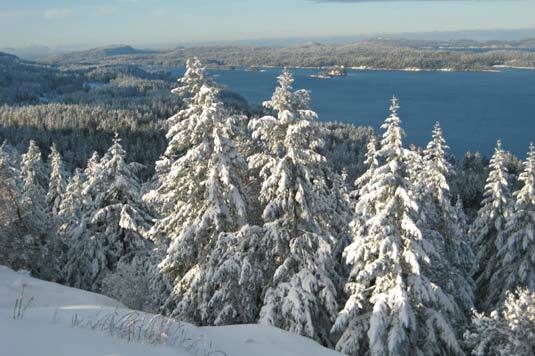 Here’s the same view from our home today, Christmas Eve 2008, with Ganges Harbour in the background. Rosemarie sent a Christmas Message to explorers of the Canadian Chapter. Her message has since been sent to several thousand explorers around the world. We thought you too would enjoy the very special Christmas sentiments and also the commemoration of an extra-ordinary exploration that took place at this very time of year, 40 years ago. Christmas Eve 1968, EXACTLY 40 years ago TODAY, Apollo 8 entered lunar orbit. With the success of this first manned mission to the moon, people everywhere celebrated! We were inspired. Man’s knowledge was greatly expanded. 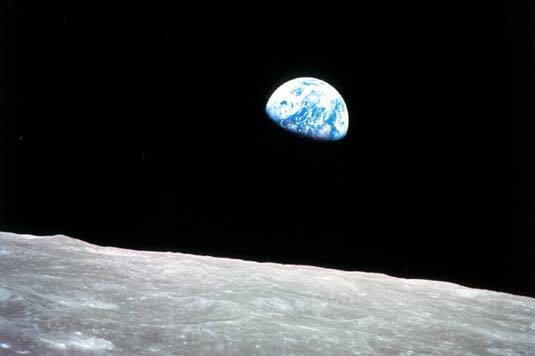 The environmental movement was energized with an iconic image Earthrise Bill Anders, a photo taken and beamed to Earth on Christmas Eve. This single image has had a profound impact on all of mankind. It was the first time our planet was seen by man to rise above the horizon of another heavenly body. 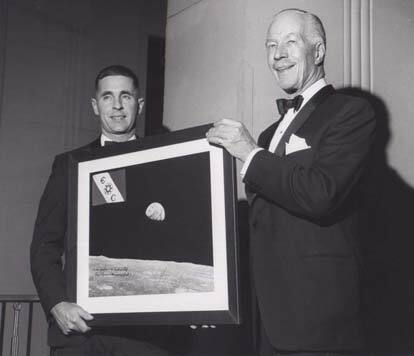 The Apollo mission carried The Explorers Club Flag into orbit around the moon. From the archives of The Explorers Club is this 1969 photo of Bill Anders being congratulated by Walter Wood, Explorers Club president. Apollo 8, the first manned mission to the Moon, entered lunar orbit on Christmas Eve, December 24, 1968. That evening, the astronauts: Commander Frank Borman, Command Module Pilot Jim Lovell, and Lunar Module Pilot William Anders did a live television broadcast from lunar orbit, in which they showed pictures of the Earth and Moon seen from Apollo 8. Lovell said, “The vast loneliness is awe-inspiring and it makes you realize just what you have back there on Earth.” They ended the broadcast with the crew taking turns reading from the book of Genesis. For all the people on Earth the crew of Apollo 8 has a message we would like to send you. “And God called the light Day, and the darkness he called Night. And the evening and the morning were the first day. And God said, Let there be a firmament in the midst of the waters, and let it divide the waters from the waters. Merry Christmas Everyone! Wishing you many fine explorations in the New Year!